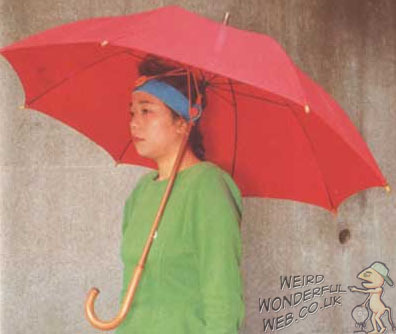 Weird Wonderful Web: Umbrella headband! Umbrella headband - when a normal hat just wont do! You know what it's like - you've got heavy shopping to carry home on a day with heavy rain. Well, what's a girl to do? You either distribute your heavy bags evenly between your two hands and get very drenched, or you carry the umbrella in one hand but with all the shopping bags in the other. You stay dry(ish) yes, but you have to do the arm swap thing between umbrella and shopping every two minutes before your arm falls off. Well not anymore!... once you've obtained the amazing and ultra cool looking umbrella headband/hat thingie. Problem solved!